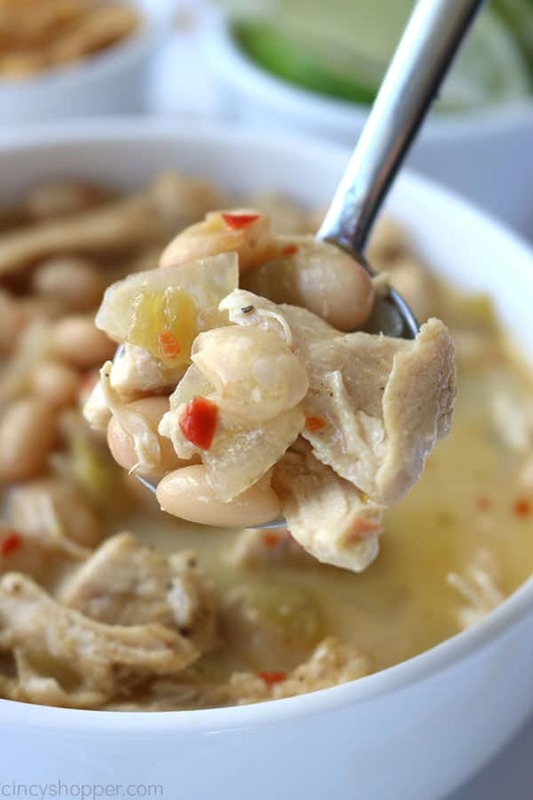 If you are needing a tasty chicken dinner recipe, look no further than this Easy White Chicken Chili. 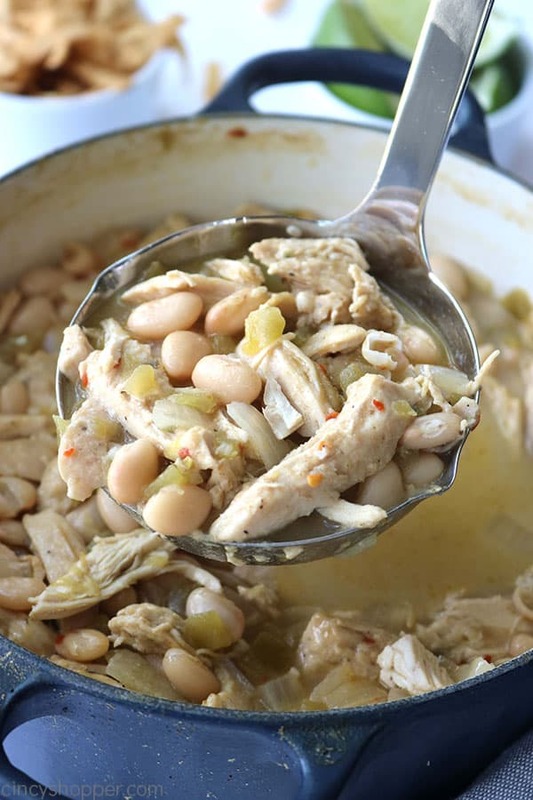 You will find it loaded with shredded chicken, white northern beans, cheese, a bit of cream, and tons of flavor. Serve with some crusty bread for a perfect meal. If you have yet to try white chicken chili, this recipe is a must make. It is great for a weeknight dinner, a potluck, or perfect for serving on game day. Since you can use a rotisserie chicken and canned white northern beans, the process is so quick and easy. 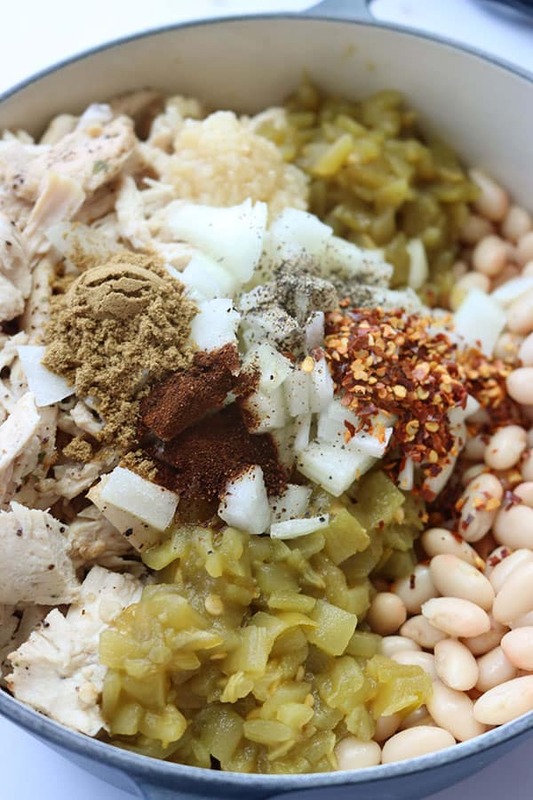 I used my Oven Baked Chicken Breast, it can be made so quickly and the flavors are perfect for adding to our white bean chili. Some of us prefer to add lots of heat to our chili. Others like to keep their chili more on the mild side. Since this recipe uses simple ingredients, you can adjust the level of spice. It’s sure to please. This recipe uses canned green chilis. I used mild green chilis to keep the chili kid friendly. If you prefer a ton of spice, go ahead and use hot or maybe use one hot and one mild. The addition of the red chili pepper flakes is what gives the chili a kick. If you like a more mild chili, go ahead use less red pepper. We like a bit of kick so this recipe without any modifications was perfect for us. 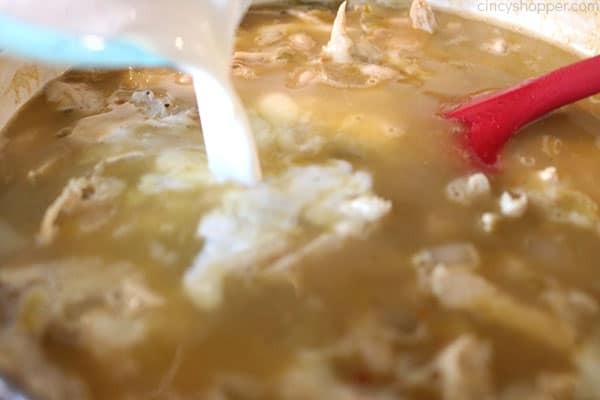 I would not call this a creamy white chicken chili and I would not call it a thin soup chili either. I add in just a hint of spice and creaminess with the pepper jack cheese. If you do not have pepper jack on hand, you could omit it. You could add in any cheese of your liking. Just be sure to shred your cheese yourself. Pre-shredded cheese will not work. If you do not have any half and half, you could also use a bit of milk or omit it completely. I personally feel the cheese and the half and half really add to the thickness level. Soups and chilis are perfect on cold days. I think chili is simply a real comfort food. 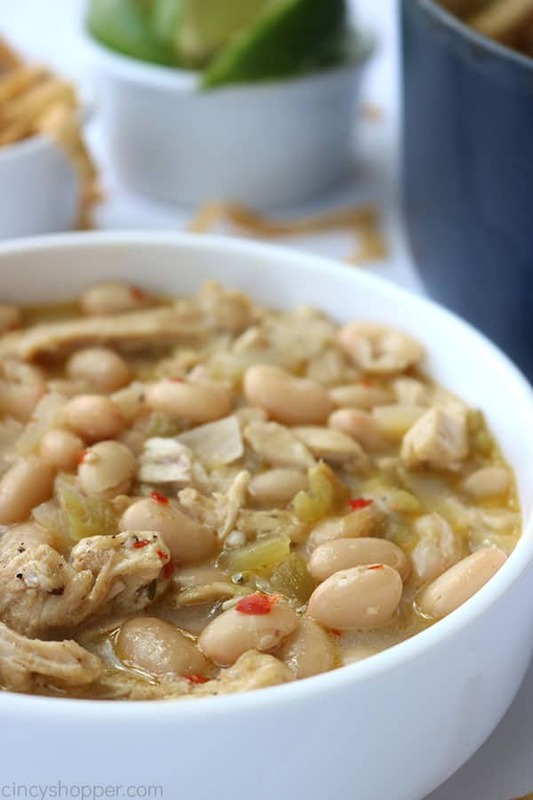 There are so many variations of White Chicken Chili. 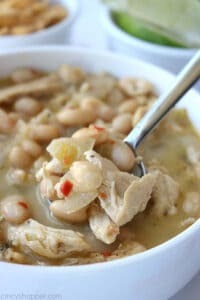 I think this version is The BEST White Chicken Chili I have tried. It is a simple recipe that is so delicious. 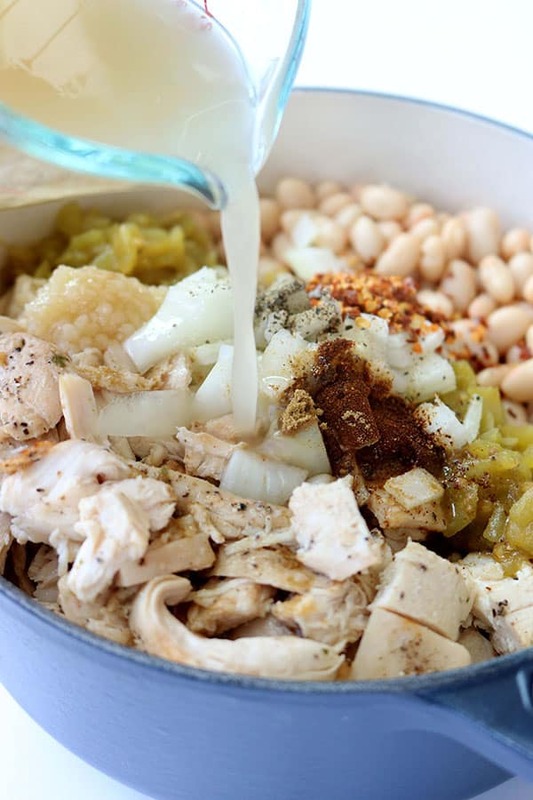 In general, many recipes for White Chicken Chili are healthy. You could most definitely make this recipe without the half and half or cheese for a much healthier version. 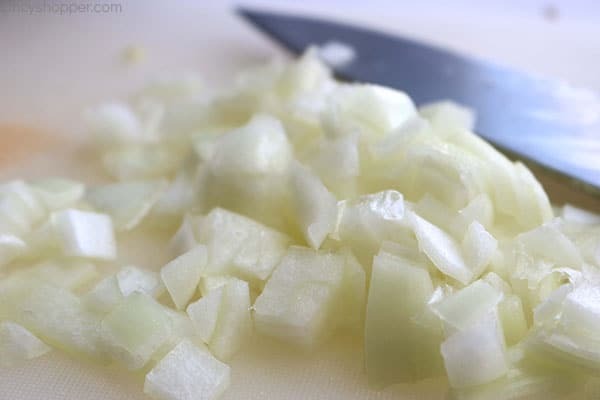 You will still have a very flavorful chili without the additional fat. Offer up some healthy avocado or maybe even some low fat sour cream on the side. 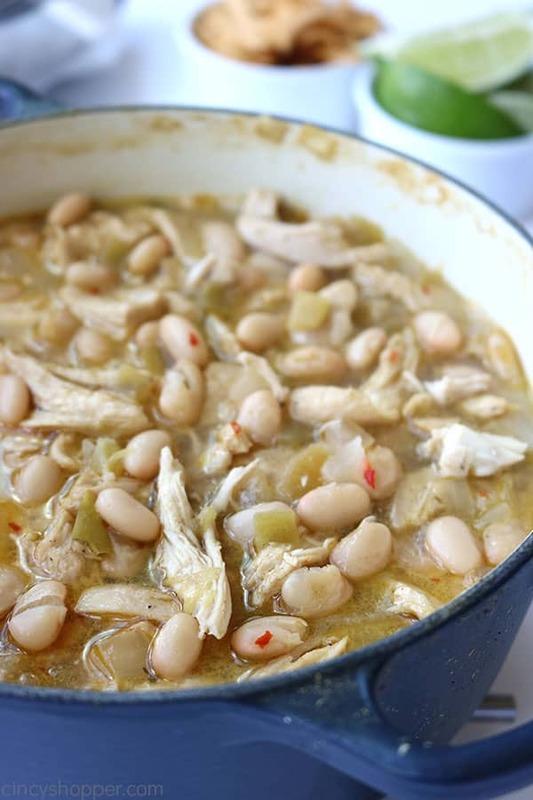 Most White Chicken Chili recipes use great northern white beans. Some others will use a navy bean like the ones found in Paula Dean White Bean Chili. I prefer to keep this recipe easy so I use the canned beans that require no work and less cooking time. 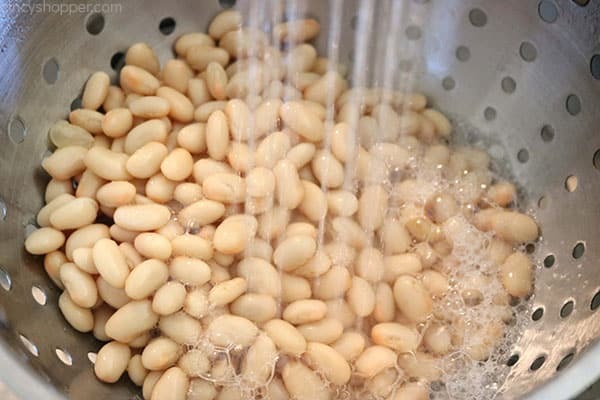 Drain and rinse beans and add to large pot. Add chicken, chiles, diced onion, garlic, cumin, chili powder, red pepper, salt and pepper to pot. Cover and simmer on low for 45 minutes, stirring occasionally. Add shredded cheese and stir in to combine. Add half and half and stir in. 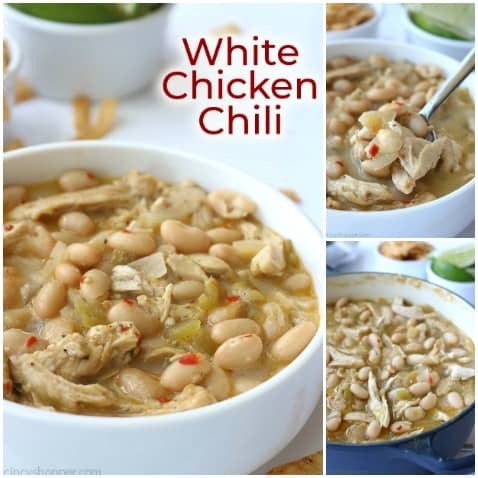 Can I Make White Chicken Chili in a Crock Pot? Sure. 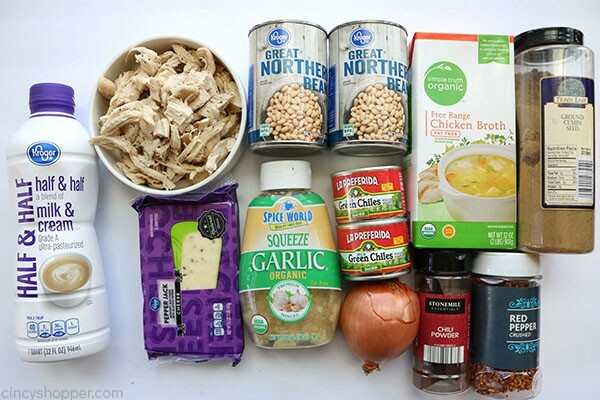 You can place all the ingredients except for the cheese and the half and half in the slow cooker. Cook it on low for about 8 hours or on high for about 4 hours. About 30 mins before serving, add in the cheese and half and half. Then continue to cook on high for about 30 mins. 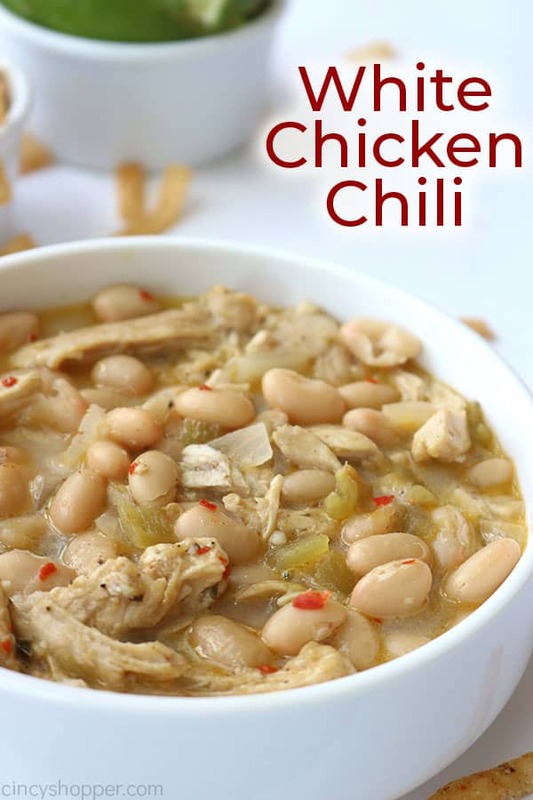 Can I Freeze this Chicken Chili Recipe? I suggest not freezing this recipe. The reason being is the dairy from the cheese and the cream. I would be worried that freezing would not work well as the dairy will tend to separate. 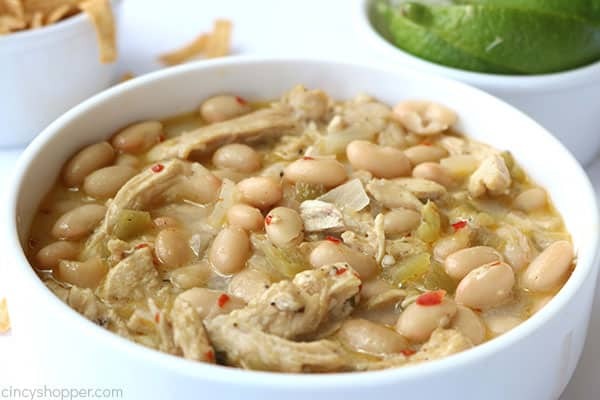 What Toppings Can I serve with this Easy White Chicken Chili? Go ahead and offer up some tortilla strips, shredded cheese, sour cream. You could also add some sliced jalapeno or cilantro for those would like those. Consider serving some fresh avocado.